New Price Computing Scale with Integral Printer – Coming Soon! Early next year you will see a new label printing scale will hit the market place. Tentative date is February 2016. A top United States scale manufacturer will introduce a brand new electronic price computing scale with integral label printer. We will be sure to provide additional information as it becomes available. Don keeps that old-time, first name relationship with his loyal customers and takes advantage of the most sophisticated weighing, pricing and labeling equipment. “When I first bought the shop, I worked 60 hours and more a week. I had two employees. Now I have five people full time and eight part-time people on weekends. We’ve added so much more. Now we have homemade chicken and turkey sausages. We opened a new deli meat case in October and added two more Ishida Astra scales that label the deli bags very neatly. We custom cut and trim our fresh pork and poultry and wrap it in butcher paper. We needed a price-computing scale that printed labels with all the food information and our distinctive logo. We needed all the equipment linked together and to a PC.” The Astra communicates via an RS-232 serial connection, and Don uses his netbook portable PC for all PLU and price updates. The easy-to-use Astra label-printing scale offers more features for less cost. The operator-friendly keyboard speeds up transactions with up to 88 preset keys. Astralink PLU editing software allows customization of the operator keysheet inserts. The Astra can store hundreds of PLUs and comes standard with eight label formats. If you go, a Westside Market veteran advises shoppers to hone bargaining skills and bring cash—small bills, fives or tens, and a shopping bag. To get the best of these offerings you must do what your grandparents did—forge relationships. Forget how you behave at the grocery store; this is no grocery store. This is a place where your butcher knows your name; your fishmonger personally scales your fish; where you can spend 30 minutes tasting and buying cheese. Click here to see the entire article. 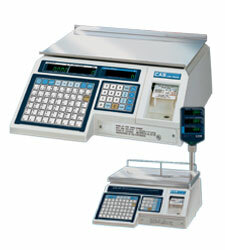 The CL5000 Label Printing Scale has the functions you need at an affordable price. Includes CL-Works software package. Use in supermarkets, specialty stores, deli’s and more! For a limited time, earn a $50 gift card for each label printing scale purchased. Contact Central Carolina Scale for more info. Take CAS’s most popular label printing retail scale, the LP-1000 series, make some improvements like allowing 4000 Price Lookups (PLU’s) and you have the new CAS LP-1000N and LP-1000NP (pole model) label printing scales. 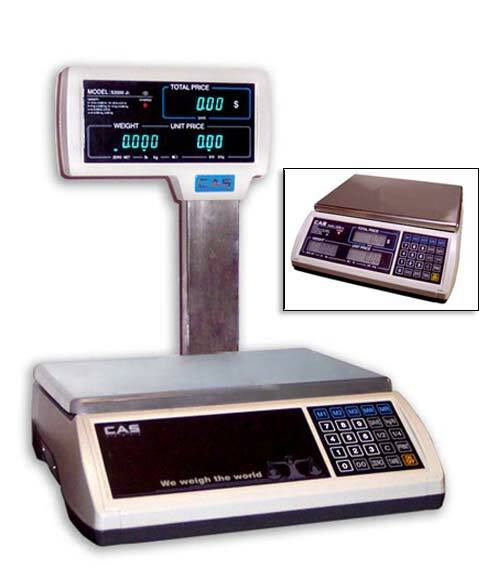 These CAS label printing retail scales are widely considered the best scale on the market today in its class. The LP1000N and LP1000NP are a feature rich, easy to use label printing scale backed by a leader in the industry, CAS corp.
With its ability to use the most popular label formats, print ingredients, includes software for your PC, the CAS LP-1000N will be perfect for delis, convenience stores, meat counter, bakery, grocery stores and more. Choice of 5 different labels. These CAS LP-1000N label printing retail price computing scales are available from Central Carolina Scale out of Sanford, NC. CAS Corporation model S-2000Jr. is a general purpose price computing scale for direct sale of commodities in stores such as: supermarkets, delicatessens and groceries. The Model S2000 Jr. price computing scale is available in several different configurations, they include three multi-interval capacities and two display configurations. This scale has an eternal lb/kg conversion switch. The scale has dual markings and the lb/kg switch changes enunciators for proper indications. Tare weight may be entered using: platter tare, key board tare and tare programmed with a PLU. The scale features a choice of LCD or VFD Displays, Stainless Steel Platter, 1/2lb And 1/4lb Keys where allowed, 3 Direct PLU’s & 199 Indirect PLU’s and choice of Optional Pole Display. The S2000JR also includes an RS-232C serial port for interfacing to the DLP-50 label printer.